Many of these are outdoor activities, so please remember to dress for the weather! Wait for a nice evening or take umbrellas. Plan to buy hot food or drinks at the event or take a thermos with you. I’d also recommend going earlier in the season to avoid crowds. Put babies in a baby carrier rather than stroller to keep them warm and make it easier to navigate crowds and paths. 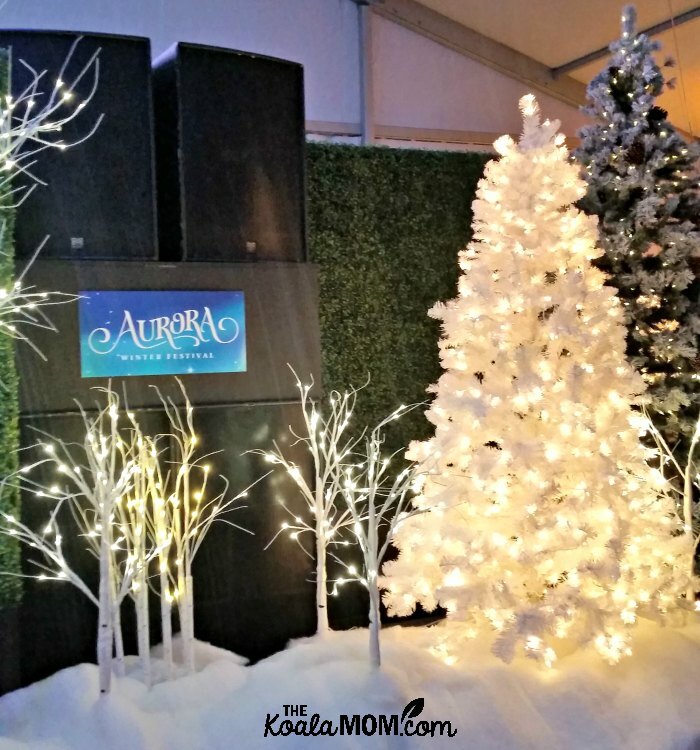 The Aurora Winter Festival features a hidden village with a beautiful skating rink, tube park, massive light displays, Christmas Market, amusement rides, food gardens, magical characters, and plenty of other exciting activities. Dates: The Aurora Winter Festival runs from November 23 to December 23, 2018. Good Noise Vancouver Gospel Choir presents their beloved sell-out holiday concert, Good Tidings, at Christ Church Cathedral. 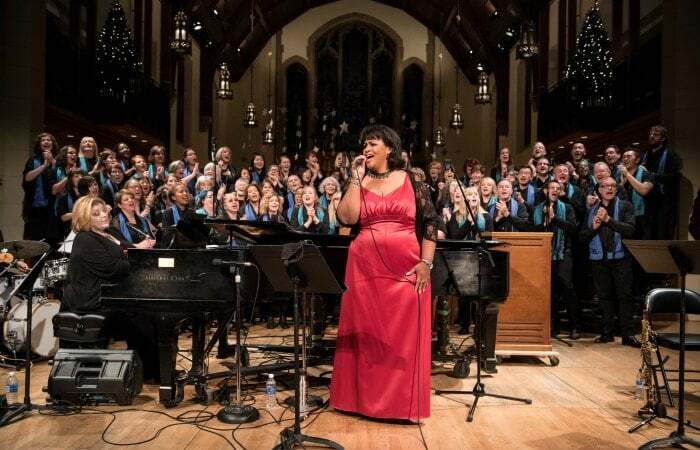 For the second year in a row and by popular demand, Good Noise will be joined by critically acclaimed Canadian jazz singer Maureen Washington in a glorious evening of gospel, soul, and jazz Christmas favourites. With infectious energy and deeply felt arrangements, this Good Noise Gospel Christmas will have audiences dancing in the aisles in joyous celebration of the holidays. Dates: December 14 at 8 pm and December 15 at 3 pm and 8 pm, 2018. Cost: Tickets for a family of four are $80. 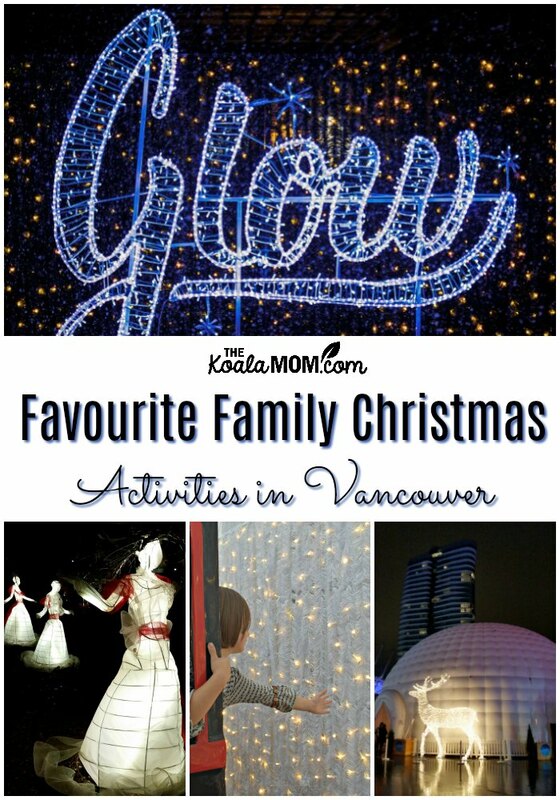 Christmas Glow is the largest indoor Christmas festival in Greater Vancouver. This year, it’s doubling in size and introducing a brand new theme: Glow Around the World. 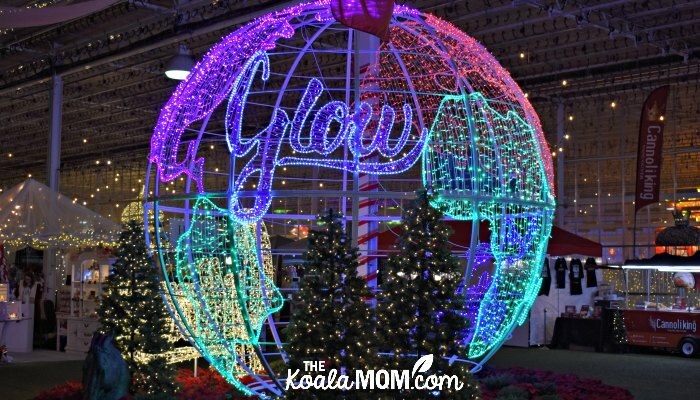 Taking place in the Milner Garden Centre in Langley, Glow brings together the people you love to stroll, laugh and play under the twinkle of a million lights. 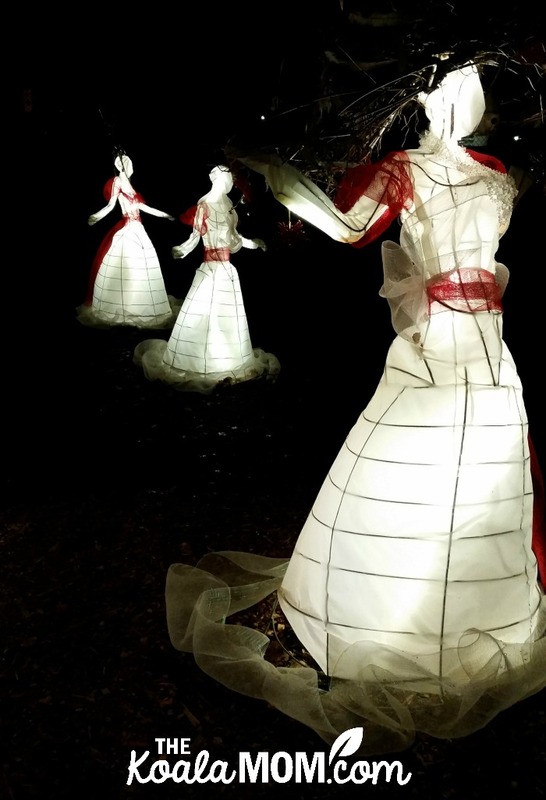 Featuring interactive displays, illuminated sculptures, playgrounds, music and a market, Glow is sure to be a memorable experience for the whole family. We went to Harvest Glow this fall and were super excited for Christmas Glow. It exceeded our expectations! Dates: November 22 to January 19, 2018. Cost: A family pass (2 adults and 3 kids) is $70. Children under 3 are free. Head just up the road to Harrison Hot Springs for their Lights on the Lake! Grab a hot drink at a nearby cafe and plan to soak in the hot springs pool before or after you wander the lights along the waterfront. 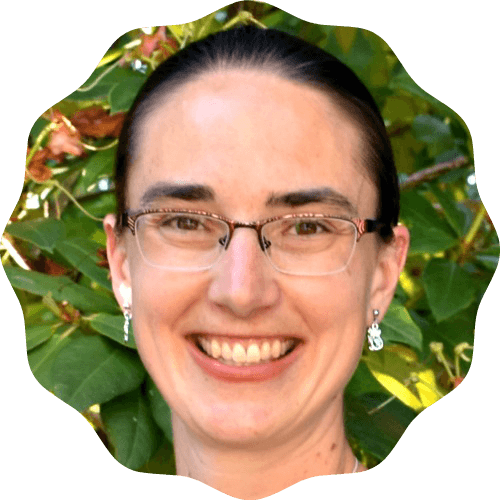 Cost: FREE to view the outdoor lights! Located downtown, this traditional German market offers kids’ crafts, yummy food and drink, live music, and local vendors. View the vendors’ list and get your tickets online before you go. Dates: November 21 to December 24, 2018. Cost: Family admission is about $30, plus extra for the carousel rides. An unlimited carousel ride pass is $10. Children under 7 are free. Fly over the North Pole this Christmas with Flyover Canada! The Christmas Special includes a Winter Wonderland themed pre-show, FlyOver Canada and an extended, animated final scene over Santa’s magical North Pole! You can also stop by the festive outdoor sightseeing deck to enjoy Christmas lights, hot drinks, seasonal snacks and holiday melodies. Dates: The Christmas Special runs from November 22 to January 6, 2018. Cost: Family admission is about $90 (buy tickets online for a 15% discount). Note: children must be 40″ tall to go on the ride. Wanna do both the Christmas Market and Flyover Canada? Get the Holly Jolly Combo to save money on your admission to both events! You’ll also save on parking and the trip downtown, since both events are in close proximity to each other. Re-capture the feeling of wonder and excitement of the holiday season and be amazed by the hundreds of thousands of lights throughout Capilano Suspension Bridge Park. Get all the details and buy tickets online via the website. Note: strollers are not allowed here. Dates: Canyon Lights runs from November 22 to January 27, 2018. Cost: Admission for a family of four is about $125 (and includes an annual pass to the park); children under 6 get in for free. Your admission here is good for the entire year (turn your tickets into a membership on your way out). Consider it a Christmas present and enjoy the park for the rest of the year! This is one of our favourite places in Vancouver; you can read my summertime review here. 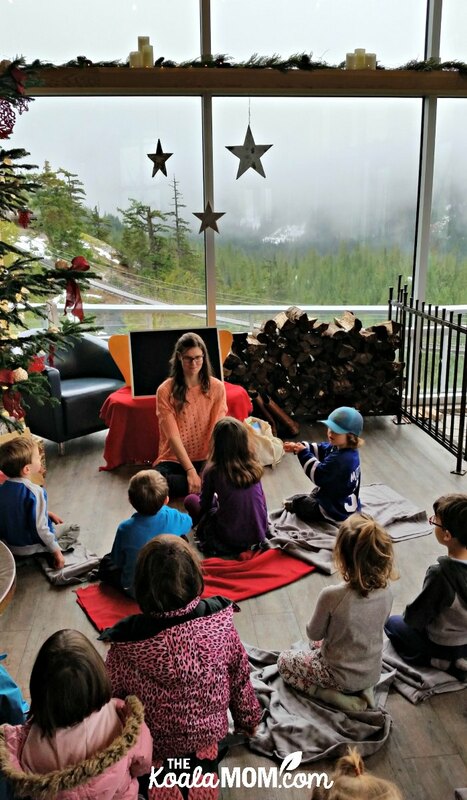 Take the scenic drive down the Sea to Sky Highway toward Squamish and ride the Sea to Sky Gondola up the mountain for more festive cheer! 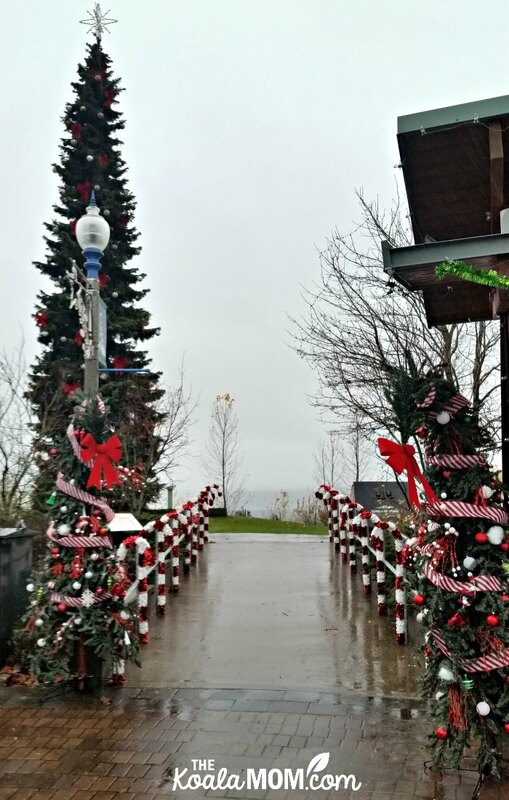 The trails at the top are decked out with holiday decorations. Drop by the website for the full calendar of events. Dates: The Spirit of Christmas runs from December 1 to January 6, 2018. Cost: A family four-pack is $108. Children under 5 ride the gondola for free. Tubing is $5. My husband took the girls to Bright Nights shortly after Pearl’s birth. They came back raving about how much fun they had! During the holiday season, the Bright Nights Christmas Train and Stanley Park Train Plaza sparkle with three million twinkling lights. Dates: Bright Nights runs from November 29 to January 5, 2018. Cost: You’ll want to buy tickets in advance as they sell out quickly. A family of four can ride the train for about $40. There’s also an afternoon train which is $6 per person. Get all the details and plan your visit here. Enjoy old-fashioned fun at the Burnaby Village Museum this holiday season! There’s special entertainment, vintage-themed displays, and spectacular lights. At the bandstand, visitors can create their own magical holiday show with lights that change colours to sound. Drop by the website for complete schedule and details. Cost: Gate admission is FREE and carousel rides cost $2.65 each. We went last year and thoroughly enjoyed running around the village checking out all the lights. The girls love the carousel, which is indoors and open to kids of all ages. It’s the biggest and best carousel we’ve seen around Vancouver. You can read my summertime review of the museum here. 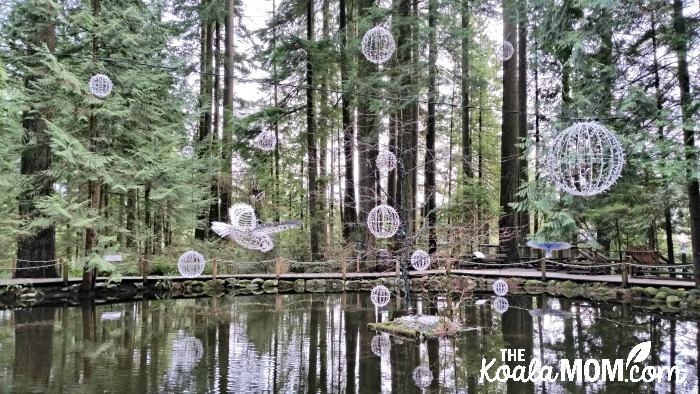 In winter, VanDusen Gardens turns into a winter wonderland with lights galore! Kids will have fun searching for gnomes and reindeer in the garden. There’s also tons of photo opportunities. 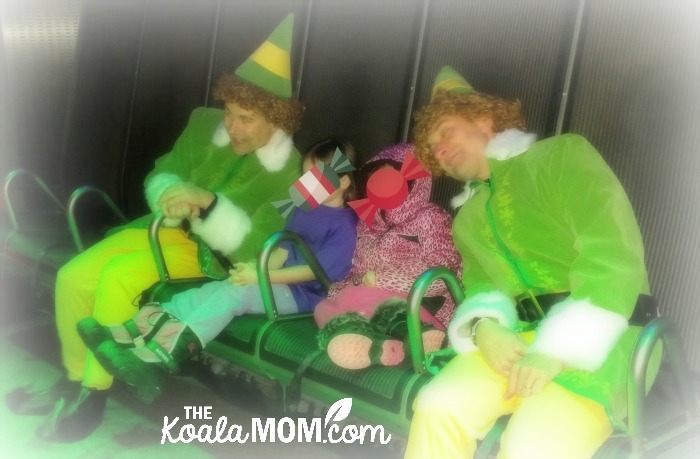 We went last year during Christmas week and the girls had so much fun following the paths and seeing all the lights. Find more details and get your tickets online here. Dates: The Festival of Lights runs from December 1 to January 6, 2018. Cost: Admission for a family of four will cost about $60 if you buy tickets online. Admission is more during Christmas week and more at the gate. Children under 3 get in free. 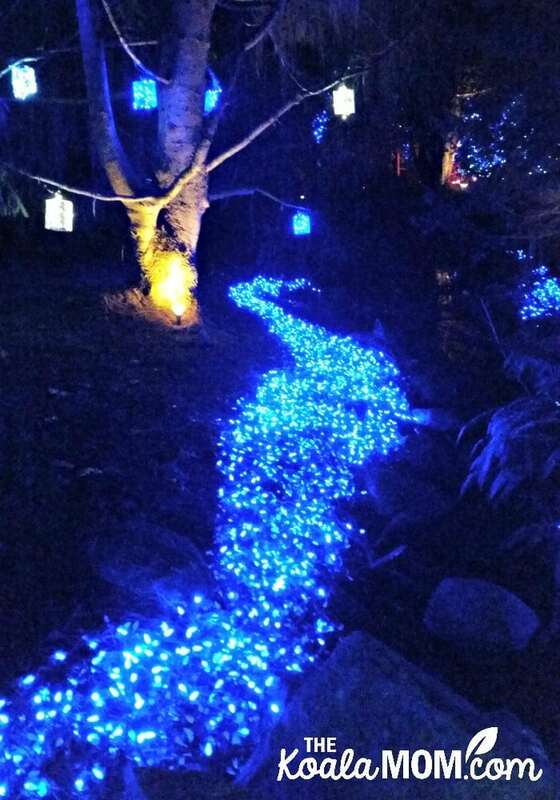 Lights at Lafarge is a beautiful holiday tradition at Lafarge Lake in Coquitlam. Hundreds of thousands of lights wrapping their way around the lake in multiple themed zones. The lake walk is a 1.2 km loop (a nice easy stroll), accessible for strollers (although it gets crowded). Dogs are allowed on a leash. New for this year is a singing Christmas tree. There are also pop-up activities including scavenger hunts, caroling and special themed nights. There’s also a concession nearby if you want to grab snacks or hot chocolate. 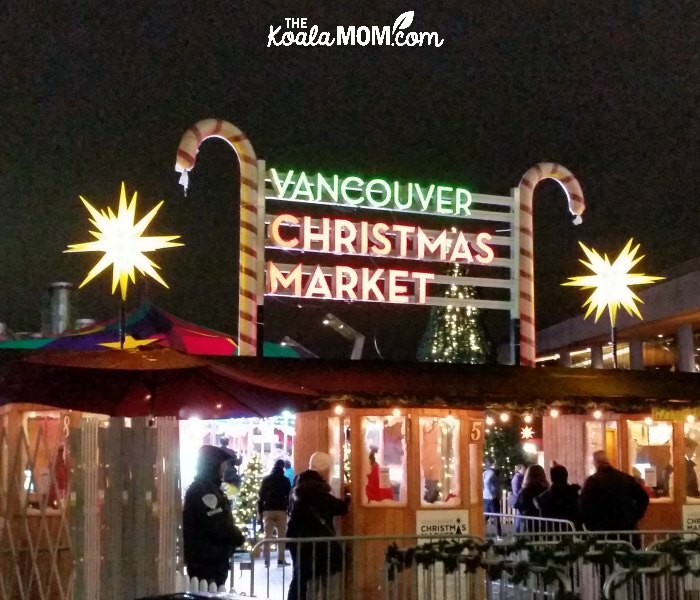 What are your favourite family Christmas activities in Vancouver?